The mini unit with max. effect: The midget among the HAUG Air Gates, it nevertheless offers top effectiveness combined with the smallest dimensions. 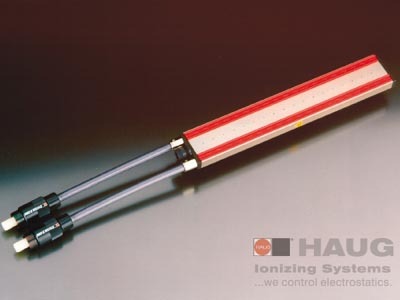 Two rigidly installed ionizing bars with circular jet nozzles guarantee the best performance. The handy unit is particularly suitable for use with smaller machines. Electrostatic charges caused by friction and subsequent separating processes prevent efficient production processing and will always result in additional costs. This is where the powerful HAUG air gates are particularly effective. Whatwever the process, they remove the dust particles and neutralize the charges. Because they reduce the quality, dust deposits are feared particularly within the automobile industry. It is here that the HAUG Air Gates have proven their worth during painting/spraying of plastic parts. Production processes in the surface treatment industry for paper, leather and plastic webs as well as laminating, converting and coating plants are difficult to visualize without HAUG Air Gates. We recommend regular cleaning of the pressure tube and precision nozzles using the special cleaning agent SRM 1 and the cleaning kit RS 1. Removal of the contamination guarantees constantly effective operation and an extremely long life of the installation. Air gate for two ionizing bars without HV-cable, without air hose. Please order the ionizing bars separately.